This new trailer for Call of Duty: Ghosts features pirate ghosts. That’s a little on the nose, don’t you think? It looks like the third of four planned DLC packs for the best-selling shooter is stretching in some interesting directions. The new Dia de Los Muertos themed level “Departed” is lively and colorful, and features an interesting “Death Mariachi” mechanic in which players can become the Death Mariachi and make others join their infernal band. “Pharoah” features an Egyptian palace and flesh-eating scarabs. “Mutiny” is a Caribbean pirate hideout featuring a pirate ship and the previously-mentioned pirate ghosts. And “Favela” is “Favela” from Modern Warfare 2, with a few architectural changes to shake things up. Invasion also includes “Episode 3: Awakening,” the third of four parts of the game’s episodic alien-blasting storyline “Extinction.” No mention was made of any new weapons in the pack. The previous two packs also included iconic movie monsters, Michael Myers from the Halloween series and The Predator from The Predator, and it remains to be seen if a new movie monster will be included or if that spot was taken by the pirate ghosts. The DLC will launch first June 3 on Xbox 360 and on Xbox One and will come to other platforms later. It costs $14.99, but can also be purchased as part of a $49.99 season pass that includes all four planned DLC packs. Santa Monica, CA – May 29, 2014 – Call of Duty® fans should mark their calendars and prepare for Invasion, as Activision and Infinity Ward today revealed the third massive DLC Pack for Call of Duty®: Ghosts. Launching June 3rd first, exclusively on Xbox Live for Xbox One and Xbox 360, Call of Duty®: Ghosts Invasion delivers four new multiplayer maps from unique locales around the world, each with hidden secrets and unique Field Orders. Invasion also includes “Episode 3: Awakening,” the next thrilling chapter in Extinction’s four-part episodic narrative taking players deep into an alien underworld to discover the truth behind the Cryptid attack. Invasion is available a la carte for a suggested retail price of $14.99, or as part of the Call of Duty: Ghosts DLC Season Pass, which gives fans access to all four epic Call of Duty: Ghosts DLC Packs** planned for release in 2014 – Onslaught, Devastation, Invasion and Nemesis – at the discounted* suggested retail price of $49.99. Invasion’s four new small-to-medium-sized multiplayer maps feature the fast-paced gameplay Call of Duty fans crave, each one donning a distinct look, feel and unique killstreak. “Departed” is a medium-sized map set in a rural Mexican town during the Dia de los Muertos (Day of the Dead) celebration. 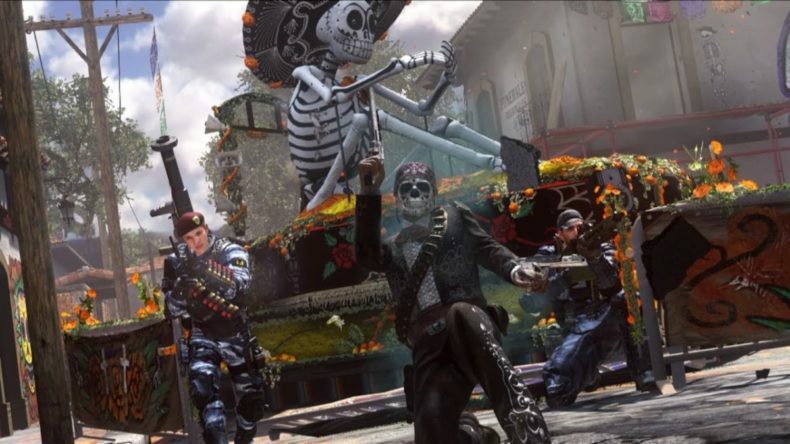 The colorfully decorated streets, vendor carts and storefronts provide ample cover for run-and-gunners, and players that complete the map’s unique Field Order will unlock the Death Mariachi killstreak. Armed with dual-wielding pistols, the Death Mariachi settles scores, with each kill turning enemy players into another member of the band, and a temporary squad mate. “Pharaoh” is the abandoned archeological site of an ancient Egyptian palace. Players will have to be on the lookout for collapsing monuments and urns full of flesh-eating scarabs, among other surprises in this multi-level map. Inside the palace, gamers will battle through multiple chambers ideal for close-quarters combat and short-range weapons, all under the watchful eye of Anubis, the half-jackal/half-human, protector of the dead, who will handsomely reward players who unlock this map’s Field Order. Invasion’s third map, “Mutiny,” transports players to a remote Caribbean island harboring an eerie pirate hideout complete with abandoned trading posts and prison cells. Speed and stealth are a must as players navigate the narrow and intertwining pathways. However, let ye be warned that gamers taking up positions on the pirate ship moored in the center of the map will become vulnerable to enemy fire from the numerous flanking routes created by the map’s horseshoe shaped dock. Players that unlock “Mutiny’s” Field Order will find themselves escorted by two ethereal ghost pirates, who will happily send enemy combatants down to Davey Jones’ locker on their behalf. Invasion’s fourth multiplayer map is a refreshed version of the fan-favorite map from Call of Duty®: Modern Warfare® 2, “Favela.” Since its original release, the Brazilian shantytown has seen substantial change. Buildings once under construction are now complete, while others have crumbled into a state of disrepair. Players must avoid falling to their death as they traverse the map from one building to the next, with ramshackle scaffolding creating varied pathways between structures, and enemy snipers taking advantage of the long sightlines. Players who complete the Field Order in “Favela” will be able to call in heavy air support from a nearby Y-8 Gunship to bring the rain with a 105mm cannon, a 40mm auto-cannon and a 25mm cannon. Anchoring the Call of Duty: Ghosts Invasion DLC Pack is the next installment in the game’s Extinction mode episodic narrative, “Episode 3: Awakening.” In Awakening, the team descends into the perilous alien underworld to strike at the subterranean fortress of the Ancestors – the mysterious puppet-masters behind the Cryptid invasion. Armed with a range of new hi-tech weapons and equipment, the team must penetrate a series of defensive barriers to reach the Ark and unlock the secrets of the Ancestors’ psychic powers. As the final battle draws closer, the fate of the Earth and the future of the human race hang in the balance. Call of Duty: Ghosts Invasion will be available June 3rd first, exclusively on Xbox Live for Xbox One, the all-in-one games and entertainment system from Microsoft, and the Xbox 360 games and entertainment system from Microsoft, with other platforms to follow. Call of Duty: Ghosts is rated “M” (Mature – Blood, Drug Reference, Intense Violence, Strong Language – content suitable for persons ages 17 and older) by the ESRB. Call of Duty: Ghosts Invasion is published by Activision Publishing, Inc., a wholly owned subsidiary of Activision Blizzard, Inc. (Nasdaq: ATVI), and developed by Infinity Ward. For the latest information, be sure to visit the game’s official Web site at www.callofduty.com/ghosts, and follow us on Facebook at www.facebook.com/CODGhosts and on Twitter at @InfinityWard.